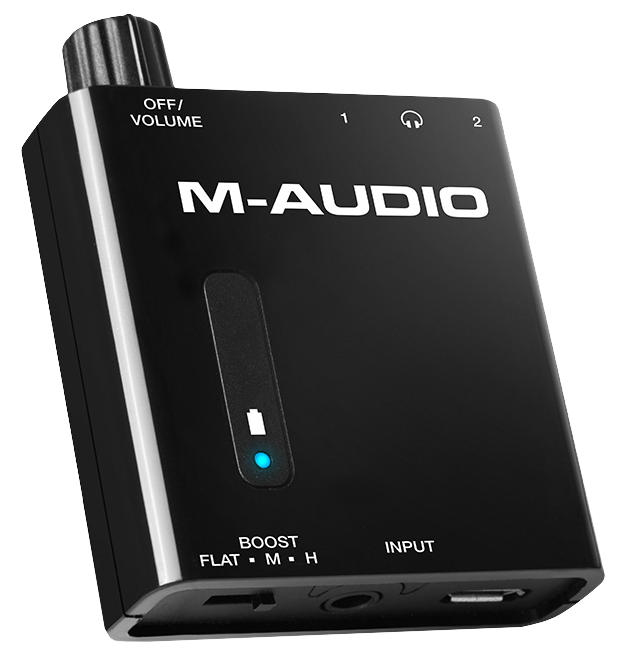 The M-Audio Bass Traveler is a portable, dual output headphone amplifier. This article discusses some common questions regarding the features and functionality of the unit. Why would I need a headphone amplifier? How long does the battery last and how can I charge it? Can I play audio over USB? What does the Boost Switch do? My headphones have an in-line microphone. Will this still work? Headphone amplifiers can be great for anyone looking to get the most out of their favorite pair of headphones and improve their overall listening experience. Cell phones, tablets and other listening devices these days may sound ok for general use, but could be lacking in overall response. A good headphone amplifier can improve the frequency response, clarity and add a much needed volume boost for high impedance headphones. They can also help in loud environments where it may be necessary to turn the headphone volume up more than normal like playing drums to a backing track. In addition, the Bass Traveler also features a second headphone output that can be used to split the signal to a second pair of headphones for a second listener. To avoid getting too technical, impedance in this case is the resistance your headphones apply to the incoming audio signal. Picture a garden hose with water flowing through it. When you bend the hose, you are resisting the flow of water and therefore adding impedance. In order to get the same amount of water to flow out the end of the hose, you'll need to increase the water flow. The same applies to your audio signal. Impedance in an audio signal is measured in Ohms. The higher the ohms, the higher the impedance or resistance level. Headphones come in a variety of different impedance levels to combat the large variety of ways in which we listen to music these days. Headphones with a lower impedance level are typically consumer style models like iphone earbuds (about 23 ohms). These work best with devices with weaker amplification systems like your iphone or tablet. Because of the lack of resistance, the iphone or tablet won't need to work very hard to push the signal through to your headphones. On the other end of the spectrum, headphones with a higher impedance (over 50 ohms) are better suited for use with stronger amplifiers, most commonly found in professional audio or stereo equipment. If you use a pair of high impedance headphones with your iphone, you may find them lacking in volume level, frequency response or clarity. This is where the Bass Traveler comes in and gives your headphones the extra boost they need to operate at their best. The Bass Traveler will support headphones with impedance from 16 ohms all the way up to 100 ohms. The Bass Traveler should be charged initially for about 2 hours before it's first use. After that, the battery should last about 6-8 hours on a full charge and will only take about an hour to charge back up again. The light on the Bass Traveler will flash to indicate a low battery charge and should be plugged in to charge again as soon as possible. The Bass Traveler will include a USB to USB micro cable to plug the unit into a USB wall charger or free USB port on your computer for charging. Your computer will need to be turned on or providing power to it's USB ports in order to charge the Bass Traveler. The light on the unit will turn purple to indicate it is charging and turn blue again once it is finished. You can continue to use the device while it is plugged in. The Bass Traveler will not accept any audio signal via USB, only the 1/8" (3.5mm) input. 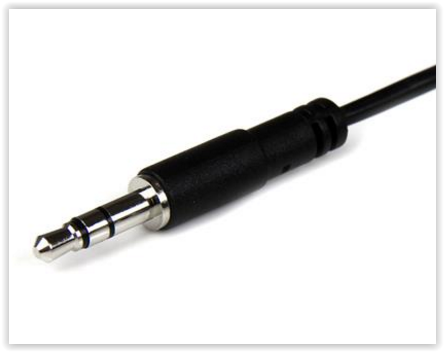 This allows the device to work with virtually any modern music listening device with a headphone port. You can, however, continue to use the Bass Traveler while it is plugged into a USB port and charging. The Boost switch is a pre-set bass boost EQ that can be switched to off (flat), a slight increase (M), or a max increase (H). This can be helpful for headphones with a limited bass response or for users that just need that extra boost in the low end. Yes! A good amount of modern consumer headphones include a microphone and function buttons built into the headphone cable. This requires an extra line of data connection that is provided by a TRRS connector. 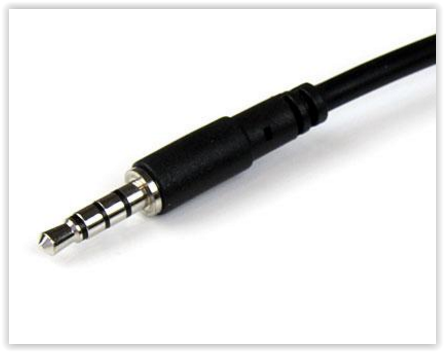 The provided 1/8" (3.5mm) cable will have TRRS connectors on either side to pass the microphone signal safely back to your phone or tablet.